My coworker, Dave, and his wife, Meredith, are giving a thoughtful gift this Christmas: homemade vanilla bean extract. I absolutely love this idea as it is extremely easy to make and can be used throughout the year. I asked Meredith to share how she came up with this idea and how she went about making the extract. She comes from a close-knit family and enjoys coming up with gifts that are thoughtful, useful and won’t end up on a trip to Goodwill. (I know that's always my goal!) She and Dave made cinnamon ornaments a few years ago and she wanted to think of a similar low-key gift to make this year. She found the extract idea on a roundup of homemade holiday gifts and used this article on The Kitchn for guidance. 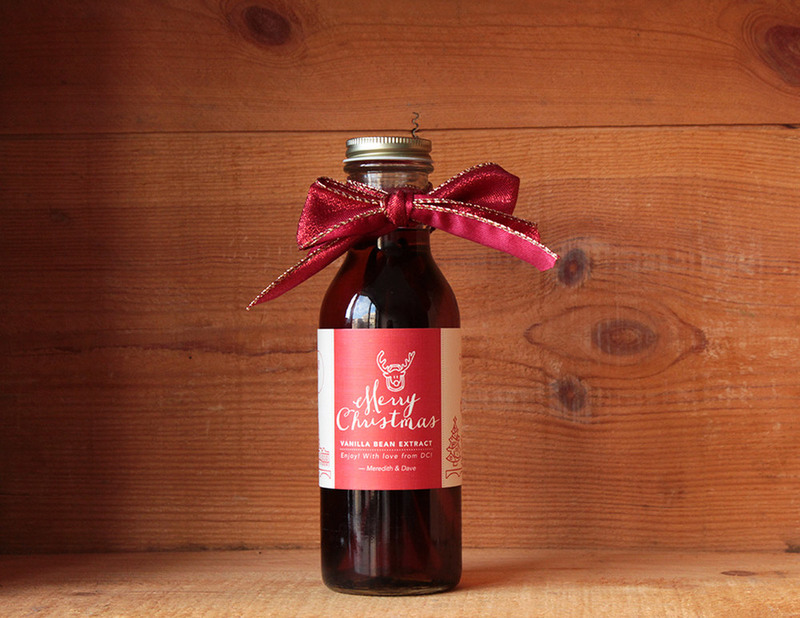 The bottles look so festive with a red bow and customized label! They commissioned the labels from designer Amy King. You can design your own labels, find a template or commission a designer depending on what you would like your project to cost. They also bought Christmas cookie cutters that will be tied to the neck of the bottle with the ribbon. 1) Split the vanilla beans down the center and place in each bottle. 2) Fill each bottle with your preference of alcohol. You don’t need a top-shelf liquor for this project! An inexpensive 80-proof liquor will work just fine. Vodka has a pretty neutral flavor. Bourbon, brandy or rum will create a more unique flavor. 3) Infuse for at least one month. The longer you infuse the beans, the stronger the vanilla flavor will be. They started this project in October so the extract will be extra strong! You can always gift the extract while it's being infused, just make sure to include a note about when it will be ready to use. $115 for 20 bottles of homemade vanilla extract. That's only $8.25 per bottle. $20 for the glass bottles: These specific bottles are from Specialty Bottling Co.
$70 for vanilla beans: You can get these on Amazon. These are on sale right now for $35. $20 for vodka/alcohol: This could be cheaper or more expensive depending on what you would like to use. $5 for printing the labels: They were affixed to the bottles with tape.